Since I'm an emotional fool, I can never say "No" to most of the people I know. At least I was like that until some time ago. Everybody loved me back then when I was the person who was always there for people and saying a "Yes" to every plan. Now that I think of it, I had a lot more friends then too. Maybe it was because I was a good person or maybe it was only because I was always accessible. It took me quite a while to realize that people are actually taking advantage of me. I was never a high maintenance person, I'd be okay with anything. But when people started cashing in on this, I realized that I was actually being a pushover. Yeah, me. Shocking, isn't it? That is when I realized that it is not really a bad thing to say "No" once in a while. I found out the true colors of most of friends once I started doing that and it is now safe to say that they no longer are a part of my life. It is always good to adjust a bit and be accommodating. But when you see that you are the only one doing this and every single time, it is time to do some thinking. And so I did. It was not easy to change myself overnight. I knew that it had to be done to save myself from a lot of heart break later in the future. I started my asking myself three questions. Do I want to do it? Will I be happy doing it? Is the person who is asking the favor worth it? If I answered a yes to either one of these questions, only then did I go ahead with it. It reduced my friend list drastically, but I no longer care. I'm very happy today with the bunch of people I have around me. Nobody likes being taken for granted, but when you have people pushing you around for what they want to do, it is time to look back and give them a smack on their face. Having said that, even today there are a few people who never hear a "No" from me. My husband, my parents and a few close, really close friends. That is only because they mark a yes on all the three questions that I ask myself. I have met a number of people who find it very difficult to say "No". They end up doing things for people and eventually get hurt in the bargain. They get dragged in to all sorts of situations because of this and later their friends blame them for it too. Some times saying a "Yes" can make you feel really good, but more often than not, that's not the case. Wake up, look around you. Ask yourself the three questions and only then decide what to do. It is extremely hard I agree, but it is absolutely important for your self worth. Are you a never say "No" person? How's the world treating you? Oh, still learning...but I strongly believe that saying a polite yet firm NO saves you from mental disturbance. People eventually understand, and think before putting unreasonable demands. Plus, it saves a lot of time. However, these gyaans don't make saying a flat NO easy. I have been questioning this for long for past few days. Saying No. looks hard at first but it is required. 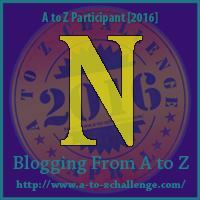 My theme for #A to Z challenge is Finding Myself- Living My life. Looks stupid and sounds even more stupid but while writing my heart out I realised saying No, being Firm may give you less people but only those who believe in you will remain with you. Writing about myself made me realise many things about finding about my goals and such stuff. My frank opinion is that it takes time sometimes in finding things that are right for you. Your post "No" resonates with my thoughts. Awin is like that. he knows people use him still does favors for them. Kudos to your girl, that's a very wise decision that will save you lot of stress. Learning to say No is an art. Learnt it the hard way! Yes, saying No was not easy for me... but once I tried doing that... life's more peaceful! i should learn the art of saying No too..